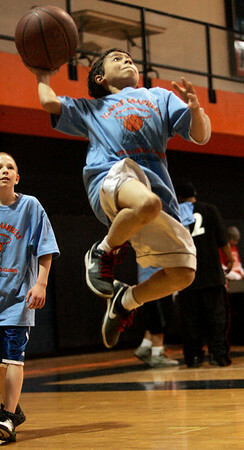 Salem: Wayland Perez goes for a lay up while competeing in a basketball tournament co- sponsored by the Gang Resistance Education and Trainging, (G.R.E.A.T) and Boys & Girls Club of Greater Salem held at Salem State College. All Saturday morning four courts were filled with kids competing to win the tournament. Photo by Deborah Parker/Salem News Saturday, March 21, 2009.